Ruth Ozeki writes with such precision and honesty that I found myself walking alongside her main character Jane Tagaki-Little, completely immersed in the story rather than viewing it objectively. I had to keep reminding myself that this was Ozeki’s first novel, because it’s so fully formed and well-written. Jane is a documentary maker who lands a job producing a television series for Japanese housewives called “The American Housewife” sponsored by the US Beef Conglomerate. She travels the country in search of families who exhibit American wholesomeness and values and can also provide a tasty meat recipe. (It’s really a great premise.) Across the world, Akiko is a bulimic Japanese housewife, watching and being moved by these shows. Opening each chapter are the words and poetry of a 1st Century female writer Sei Shonagon. Given the alternating viewpoints, the mix of verse and prose, the author’s tendency to switch from first person to third person and a jumble of faxes thrown in, this could have been a hot mess of a book. Instead, it’s a work of art. While Jane’s assignment starts out as just a job, she grows immersed in the lives of the families she chooses to profile. She struggles to balance her desire to tell the truth with her need to serve her client, the show’s BEEF-EX sponsor, personified by Akiko’s husband. 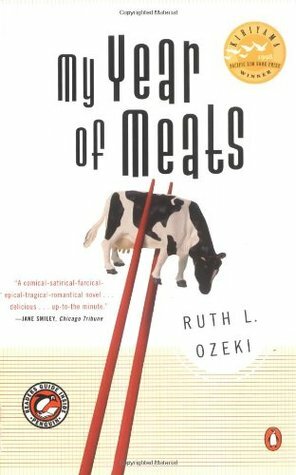 As she delves into “meaty” stories, she uncovers disturbing truths about the meat industry, which lends a very disturbing (almost sickening) undertone to the novel. Ozeki clearly points out in the author’s note that this is a work of fiction, but it feels very much like the truth, complete with bibliography and footnotes. Issues of hormones, fertility, abuse, agriculture and culture all come to the forefront, but Ozeki resists the urge to preach. Ozeki takes this novel from sharp-witted and playful to emotional and honest seamlessly. Her writing shines in the descriptions of each of the families Jane profiles, adding layers of richness to the main story. This is my second Ozeki read. Last year I fell in love with A Tale for the Time Being. I will now actively seek her out. I am officially a super-fan.